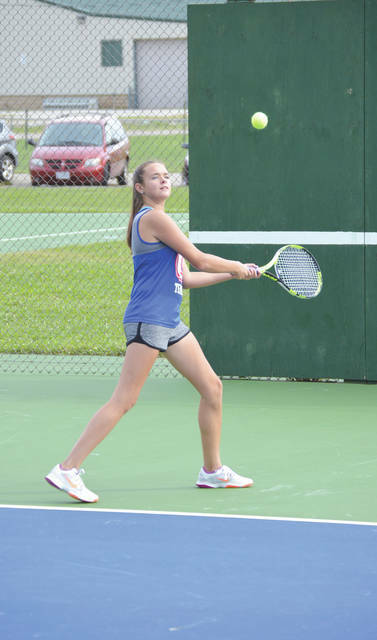 Greeneview freshman Zoe Sears hits a high backhand during warmups Wednesday Sept. 12 on the Greene County Fairgrounds tennis courts in Xenia. Sears and the rest of the Rams claimed a 5-0 win over host Xenia. Xenia senior Alexis McClelland smacks a baseline forehand prior to her Sept. 12 girls high school tennis match against Greeneview’s Zoe Sears, on the Greene County Fairgrounds tennis courts in Xenia. 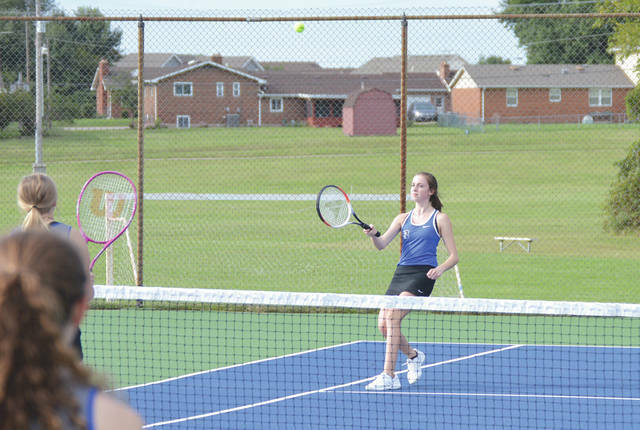 Rams junior Marinda Shoemaker moves in for a backhand volley as first doubles teammate Gracie Lucas follows the play, Sept. 12, in a girls high school tennis match against host Xenia. Xenia’s Allison Shaw hits a forehand lob down the right alley during Wednesday’s Sept. 12 girls high school tennis match against Greeneview. XENIA — Wednesday’s Sept. 12 girls high school tennis team match between Greeneview and host Xenia would appear to be a lopsided 5-0 win for the visiting Rams in the scorebooks, but both coaches felt pretty good about their respective teams after a well played match on the beautiful new Greene County Fairgrounds courts. Dave Scott, filling in for Xenia coach/wife Kay Scott who was recuperating from a recent surgery, said his inexperienced Buccaneers bunch has improved tremendously since the season started. Rams talented freshman Zoe Sears claimed a first singles win over Xenia senior Alexis McClelland, 6-3, 6-1. Junior Tori Chaney battled Xenia senior Jaedan Thomas to a close 6-4, 7-6 win at second singles. Then, Rams senior Brooklyn Biggs claimed a 6-1, 6-0 win at third singles over Bucs’ sophomore Autumn McCray. 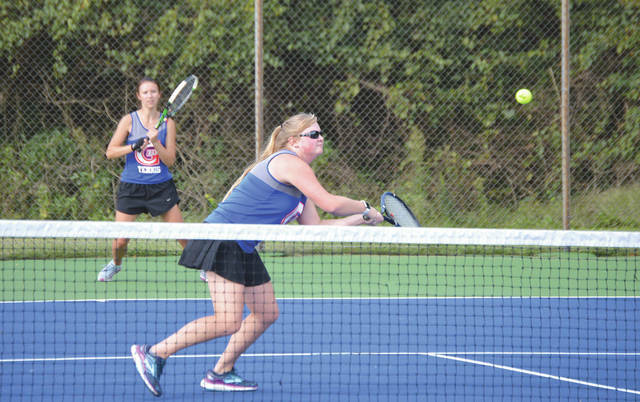 At first doubles, Greeneview’s senior Gracie Lucas and junior Marinda Shoemaker earned a 6-0, 6-4 win over Xenia juniors Anna Carlson and Ally Baker. After trailing 5-4 in the opening set, Greeneview’s second doubles tandem of freshman Brilea Bishop and sophomore Carli Vipperman rallied to claim a 7-6, 6-2 win over Xenia’s freshman-junior duo of Leah Pagett and Allison Shaw. Greeneview coach Jami Sears was understandably happy with the match result. She said the team’s performance thus far has given her reason to be happy as well. 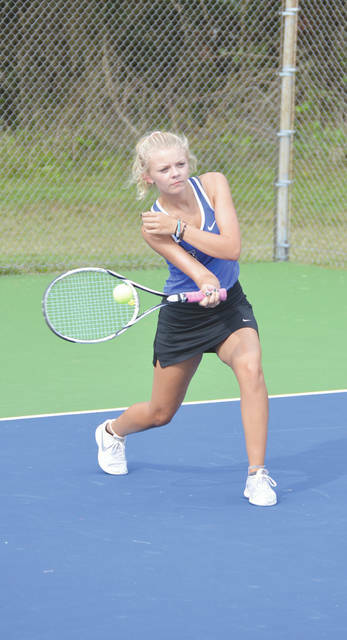 Xenia (3-7) will be back on the Fairgrounds tennis courts at 4:30 p.m. Thursday, Sept. 13, when they’ll host Greater Western Ohio Conference, American South division foe Trotwood-Madison. Greeneview gets the rest of the week to rest up. They’ll then play four non-league games in four days. The Rams will host Stivers on Monday, Sept. 17 at Seaman Park in Jamestown, then they hit the road for respective Tuesday and Wednesday matches at Oakwood and Waynesville, before getting back to Seaman Park to host Carroll on Thursday, Sept. 20.